Hi folks - new here, been reading the board for a while and I'm planning my second trip out this fall - all day hikes. 1) I've read strenuous, no shade no water many times and my first idea for a comparable "strenuous" hike is the McKittrick canyon reef trail in the guadalupe mountains. Thoughts? 2) whats the car breakin situation in the fall? would my car be safer in the pullout across from the trailhead or @boquillas lot? It's by no means an expensive car, but it Is relatively new. Do people still use ICQ? Definitely not the whole loop - would like to spend the day heading out to Randell's overlook and back, (saw the posts here, what a view! ), maybe more if the late fall daylight allows. Should be similar to McK elevation gain-wise, just wanted to check with you folks to gauge it a little better and make sure there is nothing particularly tricky to avoid (a rip in the space-time continuum, for example). Also, apologies for posting in this forum. I am driving a long way to get there so...road trip. From the M.V. trail head to the exit off-trail is about 2.5 mi. and 700 ft. elevation gain. The off-trail portion is 1 mi. and 300 ft. gain to the overlook. Do you have a map or GPS route for the off-trail part? Thanks, Reece. No GPS, just topo and maybe some google earth printouts for grins. Was thinking of cutting straight east from the trail shortly after it meets up with the western trail coming from Strawhouse (can you see this junction? ), then around the nose formed by the two draws...follow the eastern draw up, cut back to the SE around the peak and out to the overlook(ish). Seems like the easiest route but I'm certainly open to other suggestions. After the trail junction you will follow the MV down the hill towards the wash then head E but will have to work your way down into and across the first wash and down into the next one. There is a small pouroff as you round the peak to work around (we went to the right), after that it is a rocky and prickly route to the over look but there are a number of burro trails to follow, near the top we stayed more left. There are several proven routes but all are bushwhacks. I took the green route. Yep, Reece is correct and some of it depends on if you are going on to do the rest of the MV trail and/or coming back from it. 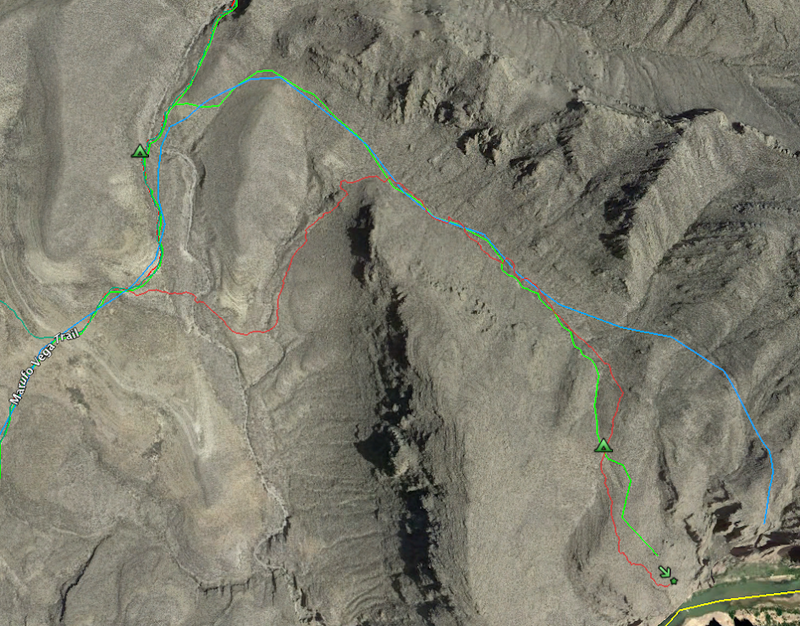 We did the red route (that I described above) and ended up at the green arrow. Great map, thanks guys! I'll look for the .pdf. Even though this will just be from th to overlook and back, I'm liking the looks of the longer green route - might be better overall visibility and less climbing for the vertically challenged like myself. The lechuguilla look like hell. Plan B will be to hike a little more of the MV and head back. Here are said PDF maps you can print out for Marufo Vega and Randell's Overlook.. Thanks very much, folks. Cheers! Thanks everyone for your maps to Randell's. I went to the park a few weeks ago when the area was slammed with 2 cold fronts and unfortunately did not make it to the overlook. I made it out to almost the turnoff for the off-trail part, but my body was just tired from camping in the cold (I've always been a cold-weather wuss) so I decided not to push it. HOWEVER, MV is amazing and is definitely my favorite trail to date. It had rained recently, so the Ocotillo had leaves and it was overall delightfully green. I also have never seen this plant before in my life (I've roamed the Chihuahuan desert plenty of times, and even lived there) and it was the most beautiful thing! Some of the hillsides were littered with these "resurrection plants" (a type of spiky moss I guess?? and definitely something that might survive under my care...). Also, have there been any reports of that trail being, um, haunted? I know this sounds completely ridiculous, but coming up on the wash on my way back to the th I saw 4 guys coming down "the climb" on MV who I had not seen AT ALL on any of the trails. I thought they were going to catch up and pass me at one point. There were no other cars parked at th, and when I got to my car I looked back and they were gone. Seriously....where did they go? Anyway it was a fun trip and I will have to tackle Randell's next time. Let's try the pictures again, shall we? I've seen those plants near the top of the crevice on the climb from Copper Plaque Falls up to Knife Ridge where there's an overlook of Bryan's Falls. They seemed to grow from a ball and fold out like a head of cabbage.